C1161. SERGE KOUSSEVITZKY Cond. Boston S.O. 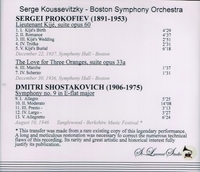 : Symphony #9 in E-Flat (Shostakovitch), recorded 10 Aug., 1946, Tanglewood; The Love for Three Oranges - Suite, recorded 30 Dec., 1936; Lieutenant Kijé – Suite, recorded 22 Dec., 1937 (both Symphony Hall; both Prokofiev). (Canada) St Laurent Studio YSL 78-180, (Shostakovitch is from rare existing copy, albeit with numerous technical flaws). Transfers by Yves St Laurent.